A nutmeg grater, or nutmeg rasp, is a device used to grate a nutmeg seed. Nutmeg graters are normally metal, cylindrical or half cylindrical, the surface perforated with small rasped holes. The nutmeg is passed over the surface to grate. 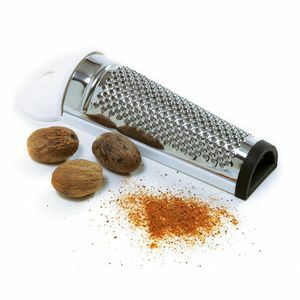 The grater may be combined with a compartment for storing the nutmeg seed between uses. Nutmeg graters are a bartenders' tool, used for adding freshly grated nutmeg to hot toddies, eggnogs, and other warm drinks.